A premium multi-angle aluminium desk stand from Olixar. 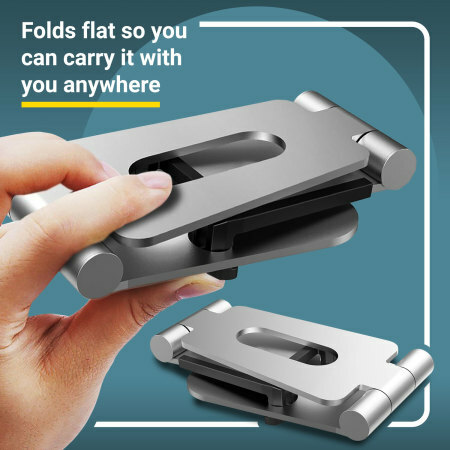 The multi-functional design allows a number of different angles and positions, while the sturdy metal construction keeps your device safe, secure and steady and your desk tidy. 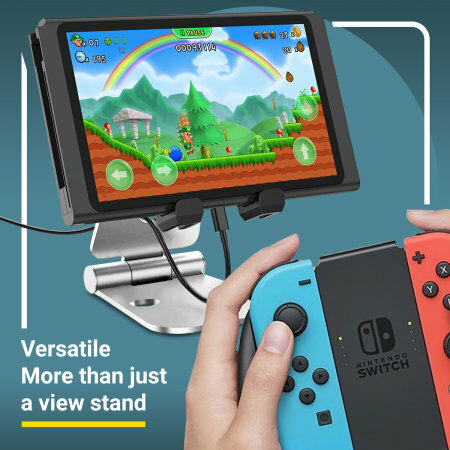 This does exactly what you want, it holds your phone or tablet at the angle you set. Doesn't droop, really impressed. I've tried a few phone stands over the years and whilst they've been useful, they've all had issues. 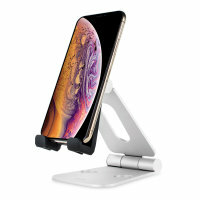 Not this Olixar Aspect stand - I've had it for a week now and it's brilliant! The USB lead can be used while the phone is in the portrait position and with its protective case still on, as can the headphone lead, which is on the bottom of my phone (Samsung S8). This is due to the 'claw-type' design of the bottom support - the gap allows the leads to be plugged in through the gap. The stand is sturdy and well designed and easily accomodates my tablet. Best phone stand ye! 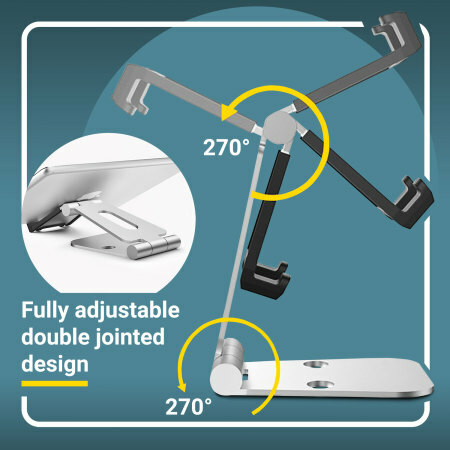 A beautiful piece of engineering and design in every way, the thoughtfully designed Aspect features 2 joints that can rotate 270 degrees that enable you to pose the cradle in any way that is practical. The joints are stiff enough to hold position and loose enough to move effortlessly and will not loosen over time. Weight of your device should not be an issue either as the Aspect is sturdy and the joints designed to hold most mobile devices easily for long periods. 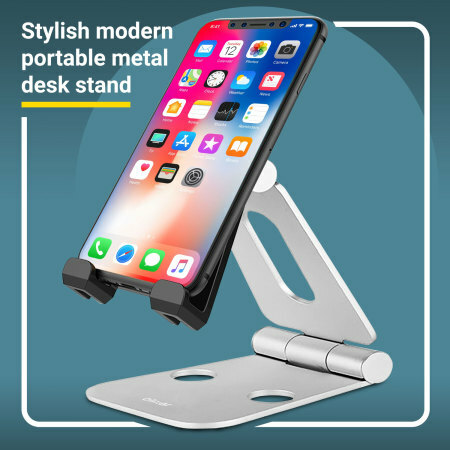 What you have here is a fully poseable desk stand that will hold your phones, tablets and many other mobile devices easily and conveniently at any angle you wish - portrait or landscape. 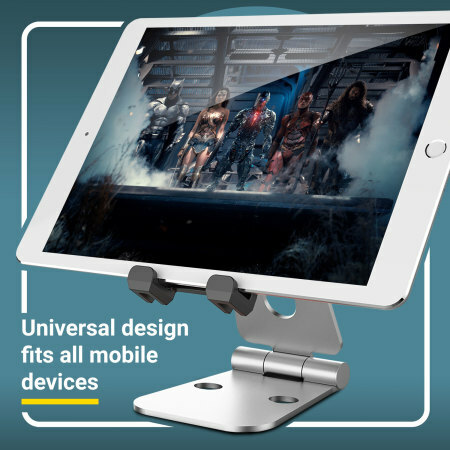 This discrete, lightweight and stylish stand is perfect for holding smartphones and tablets in place, allowing you to get on with whatever you're doing while your phone or tablet remains visible at all times. The beautifully crafted body looks fantastic and is crafted from sturdy, premium-quality aluminium alloy. With such high quality materials being used, the Olixar Aspect Universal Premium Metal Smartphone & Tablet Stand is suitable for any surroundings - perfect for use at home, in the kitchen or at work. 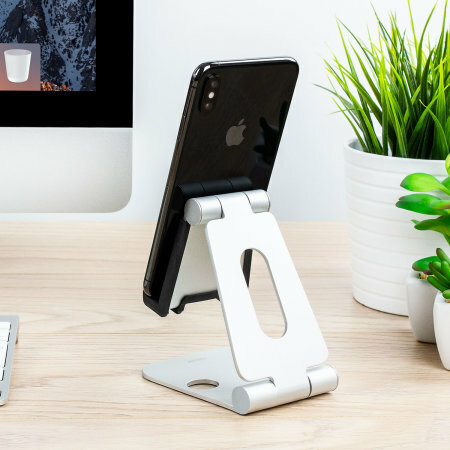 Lightweight but incredibly sturdy, this stand provides the perfect place to rest your device. With ingenious folding joints and apertures, the Aspect can fold flat (20mm approx) so you can take it with you on your travels, ready to set up in seconds. This makes it perfect for commuting, travelling and moving between workstations. Maybe you're on a train and need something to keep your device in view or maybe you're abroad and want to make a video call to loved ones. The Aspect has it all covered and is probably the only stand you'll ever need. There are almost limitless applications for the Aspect. From taking and making video calls, watching movies and other media, setting up a mobile workstation with a bluetooth keyboard or even mobile gaming, the Aspect does any job you could possibly wish it to do with ease. While the Aspect is made from stunning lightweight aluminium, it's still metal and metal can scratch your devices. It's also not particularly grippy. Thankfully and ingeniously, the Aspect comes complete with a rubber cover that slips over the business area of the stand. This provides a soft area for your devices to make contact with, and the cover features moulded arms to add extra stability. The surface in non slip and so your device will not slide out of hold. 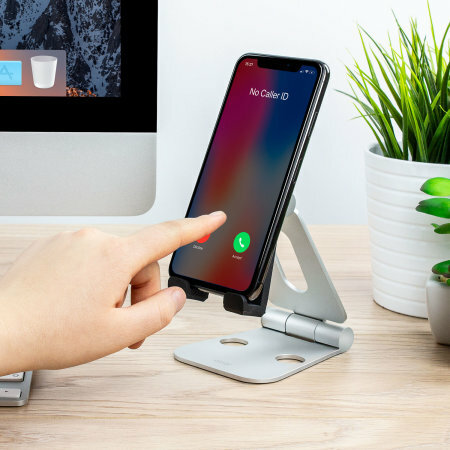 You don't need to remove your smartphone or tablet from the case to use this fantastically useful stand. Your device will work just as well within your case, saving valuable time without you having to compromise on protection. With the rubber cover fitted, you have 12-14mm or space to use which will accommodate most devices and cases. If you're not sure, measure it first. 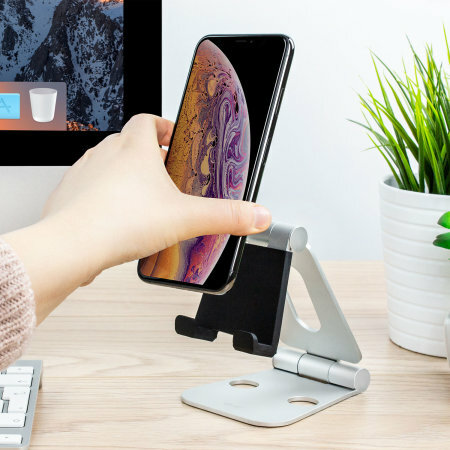 There's no point having a strong and secure grip on your device if the holder itself slides across your desk. 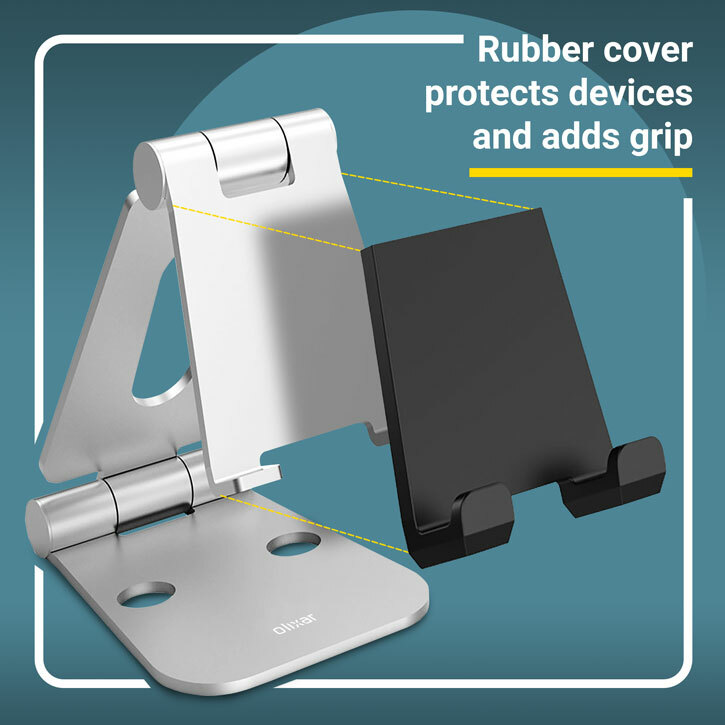 That's why the Aspect features 4 large rubber feet to keep the stand in place., even on modern smooth glossy surfaces.